Change is the only constant in the online marketing arena, and we are up to the challenge! Over the past year, we modernized our website designs, incorporated additional marketing tools into DSS, and tackled technical challenges to ensure the continued success of our clients. 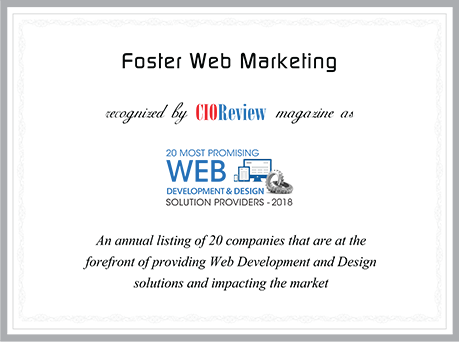 This hard work didn’t go unnoticed—we are excited to announce that we have been included in CIOReview’s annual listing of 20 Most Promising Web Development and Design Solution Providers - 2018. CIOReview is a longstanding website and magazine that reviews the top companies in a diverse range of industries. Whether they are analyzing technology, newsletters, or whitepapers, they are headstrong in ranking professionals in their respective categories. "Rather than relying only on a tailored SEO strategy, Foster tailors website content by emphasizing on the client’s history and success stories through its intuitive marketing automation software, Dynamic Self-Syndication (DSS). DSS comprises tools that amalgamate the different requirements for the generation of social media content including Content Management System (CMS), customer relationship management (CRM) and lead management. The clients using DSS can easily manage their website, traffic, leads, email marketing, reputation, social media, and local listing—in one easy-to-use tool." Request a FREE FWM analysis to get started.